When coming to Romans 11:17, Martyn Lloyd-Jones states, “This is a tremendous statement on the most important subject. From the standpoint of the future of the Christian church, and the future of the Jews as a nation, nothing is more important than this.” Romans 11:17-24 can get very complicated in a number of ways, however, at the moment we are only dealing with it in how it relates to the mission of God being sent to the Gentiles, and therefore is somewhat simpler to understand. Paul is explaining to the Romans here that the gospel coming to the Gentiles is not because of anything that they have done or deserved. He takes this time to warn the Gentiles that are being brought into God’s covenant people that although God’s mission has come to them, they are not to be boastful of themselves in any way. This warning to the Gentiles is to remind them that, like Israel’s apostasy which made them broken off from God, He can do the same to them. Moo mentions in his commentary that “Gentile believers were apparently convinced that they belonged to a new people of God that had simply replaced Israel.” Jason Meyer also makes mention of this issue, saying, “Paul highlights God ability to graft Israel in order to expose and eliminated Gentile boasting.” Paul does not want the Gentiles to receive God’s mission of the gospel only to see them become prideful or think that Israel is now done with forever. This is very apparent in Paul’s words as he says in verse 17 that the Gentiles “now share in the nourishing root of the olive tree.” This is Paul’s way of getting across that the Gentiles are in no state to boast because they are in dependence upon three things: (1) the root, (2) Christ, and (3) God. Just as Lloyd-Jones saw this importance, it is crucial for us today to understand that the mission of God sending forth the gospel was not to separate His elect! Let me say this again for those who may not understand this due to mere wishy-washy theology, or even the lack thereof: God did not plan two separate plans; He did not have plan A and plan B. He did not plan that His mission be sent out to the Gentiles, but that they reap from a different root. The Gentiles nourish off the same root that Israel did – one root, one covenant promised to Abraham, Isaac, and Jacob. And today the New Testament Church – the Gentile believers – to whom the mission of God has moved forward, nourishes off the same root that the physical nation of Israel once did. Though not are “Israel” physically, Gentiles are considered “Israel” spiritually because we all have that same root! Gentiles were strangers to the gospel, and were not of the chosen nation of Israel, knowing nothing about God. However, now that God’s mission has been sent forth to the Gentiles, we are now no longer strangers to His covenant, but are fellow saints with those who are the remnant of Israel; brothers with Paul, Peter, John, Luke, Mark, Matthew, Elijah, Solomon, David, Moses, Jacob, Isaac, Abraham, and most of all, with Jesus. It was the very blood of our elder brother, Jesus Christ, which makes us near and gives us this shared root. Christ made us brothers of the Covenant Promise with all the Old Testament saints, and the mission to the Gentiles still goes out and makes more saints of the gospel. We must thank God for this mission that He has allowed us to partake in – His perfect mission, spreading the gospel to all, going out to all of mankind to preach, teach, and speak of the good-news which God has brought forth to us, the Gentiles. There is no favor in Paul’s eyes; simply, those rooted in the covenant by Christ’s purchasing are those that have the favor of God upon them. Paul explains his illustration of the olive tree and its branches further as he makes his point about the Gentiles not boasting in anything. This is extremely important because it shows us that the church is not to become Anti-Semitic toward Israel. Although it seems hard to believe that a Gentile believer would be so, it can easily seep into the house of God where sin abounds. Paul shows in the text that those who broke off from the tree and root are those who have disobeyed God’s commands, and it was for their apostasy that the “wild-shoot” was grafted in. Here we see once more that God used Israel’s apostasy in order that He may send His mission to the Gentiles so that they can receive the same covenant-keeping promises which Israel had once enjoyed. We can only imagine what it would have felt like to be a Jew at that time, reading Paul’s illustration of the olive tree – a metaphor which is so close and so full of meaning to God’s chosen nation – and yet hear that they have been cut off from it! 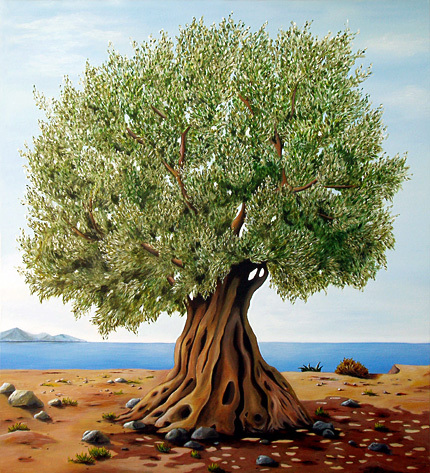 The olive tree, whose roots dig deep into the ground and is known for being steadfast throughout all weather clearly shows a picture of a covenant that is unshakable, unbendable, and unbreakable; which feeds the Israelites time and time again through battle, through hardship, through famines, and through exiles. And now they are cut from such blessings and instead see these pagan Gentiles becoming part of the dear promise which God gave to the Jews. This is exactly Paul’s warning: do not boast and do not be prideful; rather, remain humble, because if you puff yourself up and go astray, leaving the gospel truths, you will be in danger and apostatized yourself. Romans 11:22 states: “Note then the kindness and the severity of God: severity toward those who have fallen, but God’s kindness to you, provided you continue in his kindness. Otherwise you too will be cut off.” This is crystal clear – the Gentiles are not to be arrogant to the broken off branches, for it had nothing to do with neither the broken branches nor the ones grafted in, but it is God’s mission that His gospel goes forth to all the nations in this manner. Paul’s point is that the Gentiles must understand that the mission of God has come to them, but just as the apostasy of Israel cut them off, the Gentiles could also be cut off at anytime. Jeremiah 11:16-19 and Hosea 14:6-7 uses illustration as Israel being an olive tree. This seems to be why Paul used the example he did, and even more so that when referring to the branches being cut off, may have some focus towards the Jews of his own day. As getting “complicated” I am referring to the Dispensational take on the passage which uses verses 17-24 in order to define that there are two separate people groups in which are totally different in identity. In comparison with the Covenant view which sees the elect Gentiles partaking of the same benefits and covenantal promises that the nation of Israel had. Jason Meyer, The End of the Law: Mosaic Covenant in Pauline Theology. Ed. E. Ray Clendenen, (B&H Publishing: Nashville Tennessee, 2009), p. 181. Meyer, The End of the Law. p.182. Lloyd-Jones, Romans: Chapter 11. p.103. Cf. Lloyd-Jones, Romans: Chapter 11. p. 101-116 for a further treatment of Romans 11:17 and his dealing with what exactly the “root” is, and how that affects the thinking of the Gentile today. Cf. For deeper study on Romans 11:18: Isa. 29:10; Deut. 29:4; [Isa. 43:8; Jer. 5:21; Ezek. 12:2; Eph. 4:18]; See Matt. 13:14. R.C. Sproul, St. Andrew’s Expositional Commentary: Romans. (Crossway: Wheaton, 2009), p. 379. Cf. For a further study of Romans 11:25-32 see the following references in properly understanding the Future of God’s Mission being sent back to Israel: Isaiah 59:20-21; Ezekiel 37:26-27; Matthew 2:2; Luke 19:9-10; John 12:13, 19:21-22; Romans 1:16-18, 9:20; 11:26; Ephesians 1:9-10, 3:3-6; Hebrews 6:9, 8:12-13, 10:33; 1 Peter 2:9-10.